The evaluation and management of venous thromboembolism (VTE) in the Emergency Department (ED) is fraught with questions: who should I evaluate, who should get a d-dimer, what should the d-dimer threshold be etc. Answers, unfortunately, are far less common. Due to the enormous volume of literature produced on the topic, it can be difficult for individual clinicians to incorporate all of the information into a comprehensive approach. The ACEP policy subcommittee has taken this job on for the rest of us. This clinical policy addresses five critical questions but does so over 51 pages. We’ve boiled down the major points here. Level A Recommendations: Generally accepted principles for patient care that reflect a high degree of clinical certainty (eg, based on evidence from 1 or more Class of Evidence I or multiple Class of Evidence II studies). Level B Recommendations. Recommendations for patient care that may identify a particular strategy or range of strategies that reflect moderate clinical certainty (eg, based on evidence from 1 or more Class of Evidence II studies or strong consensus of Class of Evidence III studies). Level C Recommendations. Recommendations for patient care that are based on evidence from Class of Evidence III studies or, in the absence of any adequate published literature, based on expert consensus. In instances where consensus recommendations are made, “consensus” is placed in parentheses at the end of the recommendation. Critical Question #1: In adult patients with suspected PE, can a clinical prediction rule be used to identify a group of patients at very low risk for the diagnosis of PE for whom no additional diagnostic workup is required? 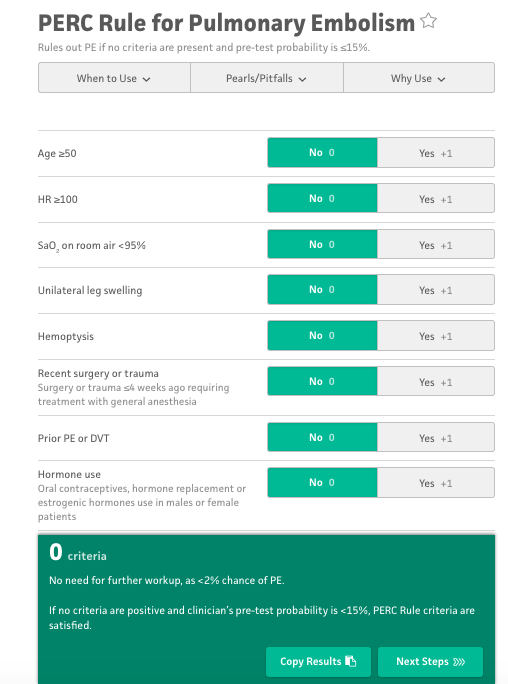 Level B Recommendation: For patients who are a low risk for acute PE, use the PERC to exclude the diagnosis without further diagnostic testing. 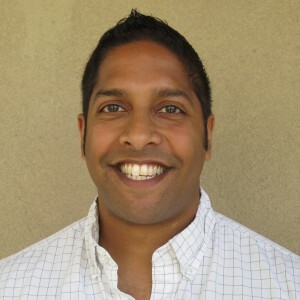 Comment: A number of blog posts have looked at the PERC score developed by Jeff Kline in 2004. Prior to using this tool, the clinician must first establish that the patient is low risk for the diagnosis of PE. The initial pretest probability is often stated at 15% though many of the studies have a much lower incidence of PE (around 5-6%). Overall if the risk of PE is ~ 10% for your patient, a negative PERC brings the patient down to a 1.9% risk. This risk is below the testing threshold meaning that further evaluation is more likely to harm the patient that provide benefit. The PROPER trial (RCT of PERC vs. standard assessment) was not included in this clinical policy (Freund 2018). This RCT demonstrated a very low risk of PE occurrence in low-risk patients who were negative by PERC (0.1% vs 0%). Additionally, imaging was reduced by 10% with application of the PERC criteria. Critical Question #2: In adult patients with low to intermediate pretest probability for acute PE, does a negative age-adjusted D-dimer result identify a group of patients at very low risk for the diagnosis of PE for whom no additional diagnostic workup is required? 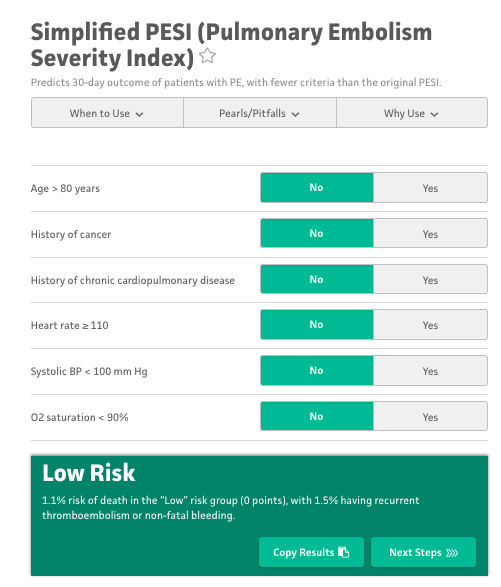 Level B Recommendation: In patients older than 50 years deemed to be low or intermediate risk for acute PE, clinicians may use a negative age-adjusted D-dimer result to exclude the diagnosis of PE. Comment: When used correctly, the D-dimer assay can be a valuable tool in risk stratifying patients in whom PE is a possibility. Though specificity of the test is poor, a normal D-dimer level virtually rules the diagnosis out. However, as patients age, higher baseline circulating levels of D-dimer are the norm. Therefore, the static cutoff of 500 FEU (or 250 DDU) may be inappropriate. Raising the D-dimer threshold with age, thus, can help to increase specificity of the test and reduce unnecessary advanced imaging (i.e. CTPA). Numerous studies (cited in these guidelines) demonstrate the safety of the age-adjusted D-dimer and this approach has been endorsed by the American College of Physicians and the European Society of Cardiology. For assays using FEUs with a cutoff of 500, age-adjustment is performed by multiplying the patients age X 10 and using this number as the upper limit of normal (i.e. a 85 year-old patients would have an age-adjusted cutoff of 850 FEU). These guidelines additionally endorse using an age-adjustment of age X 5 for the DDU assay (standard cutoff 250 DDU). This recommendation is based off of a single study (Jaconeli 2017) which we have reviewed previously. Though a number of clinicians we have spoken with have already embraced age adjustment with the DDU assay, the presence of this in the ACEP guidelines provides important support for this approach. Critical Question #3: In adult patients with sub segmental PE, is it safe to withhold anticoagulation? Level C Recommendation: Given the lack of evidence, anticoagulation treatment decisions for patients with sub segmental PE without associated DVT should be guided by individual patient risk provides and preferences [Consensus recommendation]. Comment: Multiple studies in recent years show that while more patients are being diagnosed with PE, those diagnoses and subsequent treatments have not changed overall patient outcomes. Advances in imaging technology may be to blame in part as smaller and smaller clots are able to be seen but increased workups are at least equally if not more responsible for this trend. Some small studies have shown an absence of bad outcomes in patients with isolated subsegmental PE without DVT but these studies are inadequate to base a broad recommendation on. Critical Question #4: In adult patients diagnosed with acute PE, is initiation of anticoagulation and discharge from the ED safe? Level C Recommendation: Selected patients with acute PE who are at low risk for adverse outcomes as determined by PESI, simplified PESI (sPESI), or the Hestia criteria may be safely discharged from the ED on anticoagulation with close outpatient follow up. Comment: A number of countries outside the US routinely discharge hemodynamically stable patients from the ED on anticoagulation. In the past, the reliance on low-molecular weight heparin (LMWH) with transition to a vitamin K antagonist (VKA), often necessitated admission. However, the advent of novel oral anticoagulants (NOACs – rivaroxaban, apixaban, dabigatran, edoxaban) has changed this paradigm. Patients can now be started on a NOAC and rapidly achieve appropriate anticoagulation. The key is to identify patients who are at low risk for decompensation. 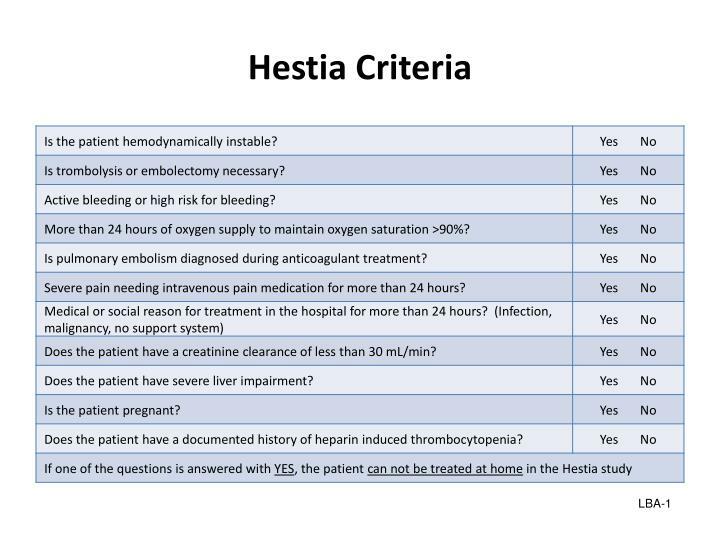 Clinicians typically use the sPESI and Hestia scores in order to aid in these decisions. The safety outcomes of interest (recurrent VTE, major hemorrhage, death) were comparable between those treated as inpatients and those treated as outpatients across the included studies. Unfortunately, the Level C Recommendation in this clinical policy is unlikely to be strong enough to lead to a marked shift from admission to discharge home. Further research is necessary but, for now, careful selection of patients for outpatient management along with close follow up can be considered. Shared decision making with the patient may be helpful as well. Critical Question #5: In adult patients diagnosed with acute lower extremity DVT who are discharged from the ED, is treatment with a NOAC safe and effective compared with treatment with LMWH and VKA? Level B Recommendation: In selected patients diagnosed with acute DVT, a NOAC may be used as a safe and effective treatment alternative to LMWH/VKA. Level C Recommendation: Selected patients with acute DVT may be safely treated with a NOAC and directly discharged from the ED. Comment: While the LMWH/VKA approach to DVT treatment is tried and true, it is complicated by requiring frequent INR testing and dietary restrictions. Many patients spend significant periods of time outside of the therapeutic window (both over and under-anticoagulated). The NOACs appear to have solved this problem. The studies we have on the drugs show non-inferiority to LMWH/VKA with reduced major bleeding and nonmajor bleeding. Most patients can be started on this drug although the “-xabans” are contraindicated at differing renal function levels. Though only a level C recommendation is given for discharge from the ED, this is routine care for most patients (i.e. most DVTs aren’t being admitted for anticoagulation monitoring). The PERC risk stratifies low risk PE patients (~10%) to a level low enough (1.9%) as to obviate the need for additional testing. Age-adjusted D-dimers are ready for use and it doesn’t matter if your assay uses FEU (cutoff 500) or DDU (cutoff 250). For FEU use an upper limit of 10 X age and for DDU use an upper limit of 5 X age. For now, subsegmental PEs should continue to routinely be anticoagulated even in the absence of a DVT. Keep an eye out for more research on this area.